Synopsis: A scientist blames the head of a large company for an ecological disaster in South America. But when a volcano begins to show signs of erupting, they must unite to avoid a disaster. Werner Herzog is best known for his compelling documentaries like Grizzly Man, Cave of Forgotten Dreams, and Encounters at the End of the World, but he’s also a renowned narrative filmmaker, having made legendary pictures such as Nosferatu the Vampyre and Aguirre, the Wrath of God. His newest narrative feature, Salt and Fire, shows that maybe, just maybe, he should stick to documentaries for a while. Salt and Fire is about a scientist named Dr. Laura Sommerfeld (Veronica Ferres from Pay the Ghost and The Comedian) who, along with colleagues Dr. Fabio Cavani (Neruda‘s Gael Garcia Bernal) and Dr. Arnold Meier (The Grand Budapest Hotel‘s Volker Michalowski), is sent to investigate an ecological disaster in South America. Upon arrival, the team is abducted by the CEO of the consortium responsible for the crisis, an intense guy named Matt Riley (Michael Shannon from Nocturnal Animals and Elvis & Nixon). Riley takes Laura out to the scene of the disaster, a long-dormant volcano that has recently shown signs of becoming active again, and strands her there with a pair of blind little boys. It is only then that Laura realizes that the problem is much bigger than she and her people thought. That may sound like the synopsis to a highly compelling political thriller, but nothing could be further from the truth. 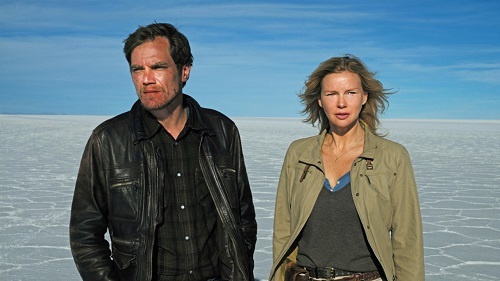 There’s only one way to put it; Salt and Fire is a bad movie. The setup falls flat quickly, as once the mystery of the scientists’ abduction is solved in the first fifteen minutes, absolutely nothing happens. Salt and Fire is as dry as, well, salt and fire. It betrays a glimmer of hope when Riley gets Laura out to the volcano and the audience starts thinking that something – anything – might be going on. Instead of riding that wave of morbid curiosity and manufactured energy, Herzog turns his movie into a wilderness adventure, with Laura struggling for survival with the two blind boys while being forced to figure out what’s happening with the volcano. Again, that description makes it sound much more interesting than the movie actually lets it be. It may be the documentarian in him, but Werner Herzog’s fiction movies tend to have a social conscience to them, and in Salt and Fire‘s case, that’s part of its downfall. The message is too obvious and heavy handed, and shows up far too late in the movie to save anything. Instead of being philosophically and environmentally educating, it just comes off as a cop out, an improbable ending to a long and tedious experience. It’s worth noting that Werner Herzog adapted Salt and Fire from a short story by Tom Bissell, who co-wrote the book upon which the upcoming The Disaster Artist, the dramady about the making of Tommy Wiseau’s legendarily bad The Room, is based. Maybe there’s a bad movie tie-in? Probably not, but boy, is Salt and Fire bad. The biggest surprise about Salt and Fire is how bad the acting is. This is not even close to a bush-league cast, but the performances from the usually exceptional actors are just awful. Gael Garcia Bernal and Volker Michalowski have very limited roles, and they do what they can with them, which is very little. Veronica Ferres is the undisputed lead, showing up in just about every scene, but she’s overly melodramatic, awkward, and wooden, like she’s reading cue cards or has been forced to memorize a poorly written script word for word. The real disappointment in Salt and Fire is Michael Shannon. Although he acts circles around the rest of the cast, even his performance is mediocre at best. He gives the impression that he is systematically and robotically reciting an oral presentation for a school project instead of acting in a feature film, over-annunciating every single solitary syllable of the unnatural and inorganic dialogue. I like to picture Werner Herzog just offscreen, pointing a gun at Shannon, forcing him to say each line of the script precisely as it was written, stripping every ounce of personality and humanity out of the words on the page. That’s a far-fetched scenario, but that’s the only excuse for such a poor performance from one of this generation’s best character actors. If there’s a reason to see Salt and Fire, it’s the beautifully isolated and untouched landscape in the second half of the film. Shot in the Salar de Uyuni salt flats in Bolivia by cinematographer Peter Zeitlinger (who has shot many films for Herzog, both documentary and narrative), the stark desolation of the dry and cracked ground that seemingly goes on for miles is easily the most interesting thing about the movie. Sure, it’s breathtaking, but when looking at miles and miles of salt desert is the selling point of your movie, you know you’re in trouble. Maybe Zeitlinger is making a subconscious metaphor with the photography, representing the boring monotony of the movie with the repetitive flatness of the terrain. Again, probably not, but it’s fun to imagine.